A little less than four decades ago and a little more than nine miles south of Northwestern, a Chicago-area school showed that one Windy City star can give rise to a contender. DePaul, a private school in Lincoln Park, had some basketball tradition, including a Final Four appearance in the ‘40s, but was not a blue-blood program by any stretch. Suddenly, the Blue Demons lost just three games and made the Elite Eight in 1978. They followed that up with a Final Four run in 1979, dropping out of the NCAA Tournament in a tight loss against Larry Bird’s Indiana State. The team was a No. 1 seed in the NCAAs four of the next five seasons and had a well-earned reputation as one of the elite squads in college basketball. The key to DePaul’s emergence as a powerhouse was signing a local prep phenom from Westinghouse on Chicago’s West Side, Mark Aguirre, who led a talented group of local stars on that Final Four run in his freshman year. And as a great team built around one of Chicago’s great players, the city rallied behind the Blue Demons in a way not seen before or since. 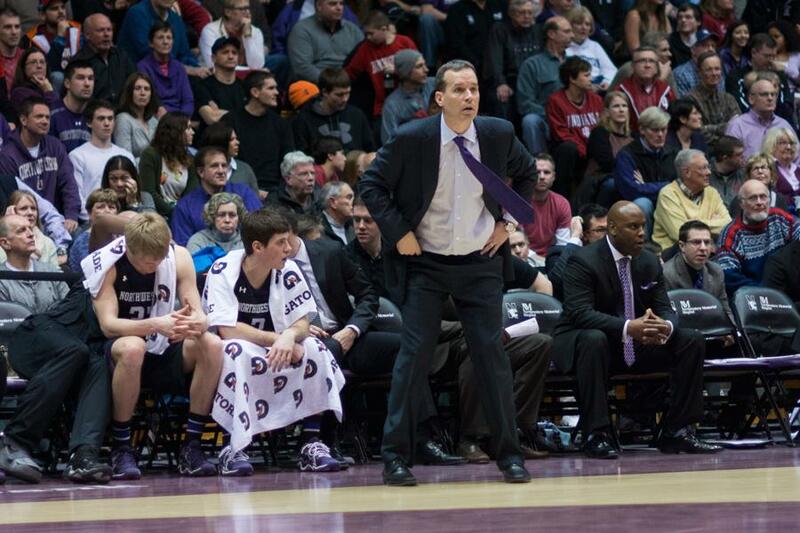 NU coach Chris Collins grew up in Northbrook during that run. “When I was kind of growing up, in the ‘80s, I remember the excitement for DePaul in this area,” he said. That glorious stretch demonstrated how a local program with a local star like Aguirre can win big, both on the court and in the hearts of Chicago’s fans. Since then, the Blue Demons have been up-and-down — mostly down recently, with the team’s last tournament appearance coming in 2004 — but that’s nothing compared to the specter of the Wildcats’ historic futility. In the last 40 years, DePaul has gone dancing 15 times. NU hasn’t been dancing once in program history. In his introductory press conference in 2013, Collins called Chicago “the best basketball city in the country.” Three seasons later, his opinion hasn’t changed. “Going to high school in this area, I understood the landscape of Chicago basketball, how good the talent was, how good the coaching was,” he said. In a city with a deeply-rooted basketball culture, the hype surrounding Chicago’s prep stars is unparalleled in the country. High school basketball is more than just a focus for the city’s inhabitants — it’s a way of life. Chicago’s stars have lived up to that hype. The area is the hometown of long-time professional greats like Aguirre, Isiah Thomas and Dwyane Wade, recent NBA No. 1 overall draft picks like Derrick Rose and Anthony Davis, and young budding stars like Jabari Parker and Jahlil Okafor. Recruiting a player of that caliber can be a program-defining moment. Even at a tier below those transcendent talents, Chicago’s finest have a track record of success. Former Illinois Mr. Basketballs like Glenbrook North graduate Jon Scheyer and East Aurora’s Ryan Boatright each starred for national champions. Just this spring, Stevenson’s Jalen Brunson, last year’s state Mr. Basketball, played an important role as a freshman guard for Villanova as it won a national title. One would be hard-pressed to find an area that places more players in every level of basketball, collegiate and professional, than Chicago. Michael O’Brien, the preps sports editor for the Chicago Sun-Times who’s covered high school basketball around the city for roughly 15 years, says the city’s unmatched depth of talent and intense focus on the game at the high school level breeds stars. Decades ago, DePaul built a top program from local stars. Today, those stars are shining as brightly as ever. Former NU coach Bill Carmody was never known for his local recruiting prowess. He was never able to develop meaningful recruiting pipelines in the city or reel in one of the area’s biggest names. In the last three recruiting classes assembled under his watch, Carmody netted only two local signees — Benet Academy guard Dave Sobolewski and University of Chicago Laboratory Schools forward Mike Turner — and neither of those players made a huge impact on the direction of the program. By hiring a former local high school star in Collins for the head job, NU signaled that it was time to take recruiting Chicago talent seriously. Collins said connecting with area recruits was a top priority upon his arrival. That focus on taking advantage of proximity to top talent has allowed Collins to broaden NU’s reach around Chicago early in his tenure. Next year, five of the Cats’ scholarship players will be local products, all signed by Collins. Players like Fenwick guard Scottie Lindsey from the class of 2014 and St. Joseph guard Jordan Ash from the class of 2015 weren’t seen as program-changing recruits when they signed for Collins. But Ash said Collins and his staff still leveraged their local advantage to its fullest in his recruitment. But even with that focus and home-field advantage, NU still hasn’t been able to bring in the biggest local stars, the players who can turn a program around single-handedly. Collins went after Marian Catholic’s Tyler Ulis in his first recruiting class, but the diminutive guard chose Kentucky, where he was the SEC’s Player of the Year last season. When this year’s state Mr. Basketball, Morgan Park guard Charlie Moore, reopened his recruitment recently, the Cats failed to even make his top eight school choices. Meanwhile, surefire stars with a national profile like Okafor and Brunson never had NU on their radars during their recruiting processes. Collins said the Cats aren’t at the level yet to win recruiting battles for that kind of player. It’s still early in Collins’ tenure, and NU can find good local players who fall through the cracks, just as Carmody did with Glenbard West’s John Shurna and Naperville Central’s Drew Crawford. But after three years, the Cats haven’t broken through on signing Chicago’s elite players. Vic Law was supposed to be the start of something new. Now going into his redshirt sophomore season, his commitment on July 4 of Collins’ first year as coach was a sign that times were changing at NU. Law was a long and athletic wing with strong grades, national buzz and the potential to do seemingly anything on both ends of the floor. He was a big part of a St. Rita team that was one of the best in the Chicago Catholic League throughout his high school career. That kind of player wasn’t supposed to sign up to play for NU — and yet there Law was as Collins’ first commitment. At the time, Law’s signing was seen as a coup by Collins. Even if Law wouldn’t change the program’s fortunes by himself, his commitment showed that Collins could draw the best local talent to Evanston. Two seasons later, the jury is still out on Law’s on-court impact. Expectations were high after he showed flashes of star potential during his freshman season, but surgery on a torn labrum forced him to take a medical redshirt last season. As he works his way back from that injury, Law is still hopeful that he can be the guy to turn the program around. But with three recruiting classes now in the books for Collins, it’s safe to say Law’s signing wasn’t the paradigm shift in the local recruiting landscape some thought it could be. Despite the momentum generated from his commitment, Law wasn’t joined by any of the area’s top players in the classes of 2014 and 2015. The class of 2016 brings a few well-regarded local big men like Hinsdale South’s Barrett Benson and Barrington native Rapolas Ivanauskas, who transferred to Brewster Academy in New Hampshire for his senior year, but neither are seen as can’t-miss stars. Law said the struggles to bring in big-name players are part of the reality of the Cats’ lower profile in the Big Ten and nationally, the kind of thing that doesn’t change overnight for a team that’s never made the Big Dance. Collins said DePaul’s run in the late ‘70s and early ‘80s, and the way that team captivated the city, is a model he believes his team can replicate. But NU isn’t at that level yet. The hype surrounding Chicago’s prep stars brings attention from top programs from around the country, and the Cats aren’t yet equipped to win those recruiting battles and find their transcendent local star; their Aguirre. Collins will take another swing with the class of 2017 after offering scholarships to Evanston Township’s Nojel Eastern and Belleville Althoff’s Jordan Goodwin, two of the top Chicago prospects entering their senior years. But NU doesn’t seem to be in the driver’s seat for either player, and O’Brien, the Sun-Times editor, said Collins hasn’t put the Cats on the radar for elite local talent at this point. The Cats have the prestige of power-conference status and local access to one of the most fertile talent pools in the country. They now have a coach who knows the area and a team showing slow but steady improvement year-over-year. On the surface, there’s no reason NU can’t sign that one star and catch lightning in a bottle the same way those Blue Demons teams did years ago. But lightning isn’t easy to catch, and Collins’ first three years are a reminder that until the team wins on the court, it’ll struggle to keep Chicago’s best players close to home.